One thing is clear, when you exercise or perspire, you want to stay fresh smelling all day long and sometime you don't get that from your deodorant because it is not used all over the body. Pure Quosa has a form of relief for this. They have cleansing body sprays in three different fragrance choices that work well for women or men, the fragrances are unisex and can be used by both men and women. Each fragrance choice also has different attributes for it that are useful for each spray. Each one feels fresh, soothes the skin and stops odor. They come in 2 fl.oz. travel sizes or larger 8 fl.oz. ($16.95) sizes that you would use once you got to know the product a little bit better. The Rain fragrance is clean and uplifting for the mind, body, and soul. Rain blends aloe, tea tree, and cucumber hydrosols with clary sage essential oil and colloidal silver. It is ideal for quick clean-up between workout and work, curbside cleaning of the kids, or restoring your body and mind after a long flight, Pure Quosa cleanses your skin naturally. Skin feels fresh, the spray soothes your skin, and stops any odor. Rain Cleansing Body Spray 2 oz. is cooling, healing and hydrating for the skin. It calms sunburn and windburn and soothes the skin. Also, it has natural anti-microbial, anti-bacterial, anti-viral and anti-fungal properties. The scent is clean and smells like fresh cucumber. Pure Quosa recommends a small patch test on skin and clothes first. If you participate in the following activities then Rain is your best scent: cycling, hiking, running, skating, yoga, Pilates and Barre. It is cooling, healing and hydrating. This product calms sun/wind burns, soothes skin with natural ingredients known for their natural anti-microbial, anti-bacterial, anti-fungal and anti-viral properties. The smell of Coastal is clean and uplifting. Coastal blends yucca, aloe and eucalyptus hydrosols with sage essential oil and colloidal silver. It is ideal for quick clean-up between workout and work, curbside cleaning of the kids, or restoring your body and mind after a long flight, Pure Quosa cleanses naturally. It feels fresh, soothes your skin, and stops any odor. Coastal Cleansing Body Spray comes in a 2 fl.oz. travel size so you can get to know it. It is positively cleansing, uplifting and cooling. The spray is cleansing and also cleanses equipment. It has natural anti-microbial, anti-bacterial, anti-fungal and anti-viral properties. The scent is calming and smells like fresh sage. Pure Quosa recommends a small patch test on your skin and clothes with this scent. If you participate in the following sports then the Coastal scent is your best choice: any ball sports, bouldering, Skydiving and Kitesurfing. It is cleansing, uplifting and cooling. It heals the skin, is a disinfectant and is good for equipment cleaning. The spray also has natural ingredients known for for their natural anti-microbial, anti-bacterial, anti-fungal and anti-viral properties. The Desert scent is complex, uplifting for the mind, body, and soul. Desert blends yucca and eucalyptus hydrosols with citrus essential oil and colloidal silver for an earthy scent. It is ideal for quick clean-up between workout and work, curbside cleaning of the kids, or restoring your body and mind after a long flight, Pure Quosa cleanses the body naturally. As it makes the body feel fresh, it also soothes your skin, and stops the any odor. Desert Cleansing Body Spray comes in a 2 fl.oz. Travel Size that is softening, healing and hydrating. It soothes the skin, it is a mood lifter and is great for anti-aging skincare. This product has natural anti-microbial, anti-bacterial, anti-fungal and anti-viral properties. The scent smells earthy and somewhat similar to a rootbeer. Pure Quosa recommends a small patch test on the skin and clothes before use. If you like these sports, then the Desert spray will be great for you: Sailing, Surfing, Swimming and Outrigging. The Desert spray is softeing, healing and hydrating. It soothes the skin, is a natural mood lifter and a skin anti-aging solution. It also has natural ingredients known for their natural anti-microbial, anti-bacterial, anti-fungal and anti-viral properties. 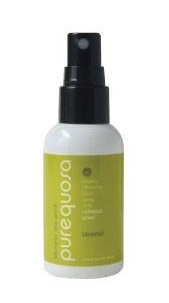 Pure Quosa is a natural cleansing body spray that helps nourish and hydrate the skin while neutralizing odor causing bacteria. The perfect companion for post workout, travel, and anytime you want to feel fresh and smell good. The sprays are most effective when applied BEFORE and AFTER a workout. Simply spray and go on any part of your body. They suggest hands, face, neck, sweat zones and feet. It is gentle enough to be used on kids and pets too. The powerful active ingredient in Pure Quosa is colloidal silver and is known to be anti-fungal, anti-viral, anti-microbial and anti-bacterial for odor neutralizing. Many of the essential oils and plant hydrosols have anti-bacterial properties as well. Pure silver (.999%) from a silver bar or wire is transferred into the water and suspended. These tiny particles are then permanently suspended with an electrical charge keeping the silver from bunching in clumps. Brownian motion is known as the random motion of particles that are suspended in a fluid and resulting from the fast-moving atoms which are not colliding. These tiny particles are always moving in the spinning water and suspended indefinitely because of the positive electrical charge. In simple terms, colloidal silver near a pathogen, virus, fungi, or bacteria starves the oxygen. These tiny particles are then metabolism enzyme of air. Silver suffocates the pathogen, and it dies. Therefore, it is an alternative to antibiotics that cause an imbalance in the gut, causing other health issues to flare up. Hydrosols, also known as floral waters, and hydroflorates, are products from steam distilling plant materials for separating the plant's oils. The essential oil rises through a condenser, and the nutrient-rich steam/water is left behind. Hydrosols offer the same benefits of the plant in a gentler strength. Personally, I loved these sprays. I felt they were a nice way to get clean when out of the house. I think these are much better than regular hand sanitizers. These can be used all over the body and make you feel better and smell better. You can use these when you cannot get to a shower. The sprays would be great for camping, after a long day of cycling, running, etc. And the best thing is, they really do get rid of body odor. These are not antiperspirant sprays, but deodorant sprays. I love the fact that physics is used here. The colloidal silver is suspended in the solution. Very cool. I think you would enjoy these sprays as much as I do. The scents are wonderful and so are the sprays. 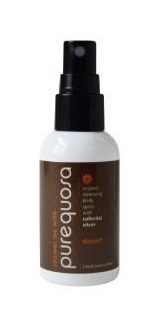 Pure Quosa Body Sprays are sold online at www.purequosa.com. Like Pure Quosa on Facebook:https://www.facebook.com/purequosa/; Follow Pure Quosa on Twitter:@purequosa; Follow Pure Quosa on Pinterest:https://www.pinterest.com/purequosa0808/ and Follow Pure Quosa on Instagram:https://www.instagram.com/purequosa/.